Just regular folks. : Emy, Nat, birthday & refrigerator. Emy came down from NY, unexpectedly, to stay with us Monday and Tuesday night. Usually we see her with Seth or Bob & Katherine and usually over a trip or holiday, it's always rushed and hectic, but this time it was just her and our regular routine! She mostly hung out here at the house, it's nice to have a chance to catch up with her. And then to overlap with that, on Tuesday night, our regular Edda-caregiver had a conflict and cancelled (weeks ago, but I had forgotten) and at the last minute I texted Nat to see if she wanted to help us out (mainly so I would have a chance to catch up with her too!) and she had some time in the evening. Both Jeremy and Vince had Tues night meetings, so after a quick dinner of chicken/mushroom/cashew stir-fry (and a just-as-quick happy birthday song for Nat as today is her birthday) it was just us girls (Edda, Nat, Emy & me) chatting for a few hours in the evening about relationships and future plans. 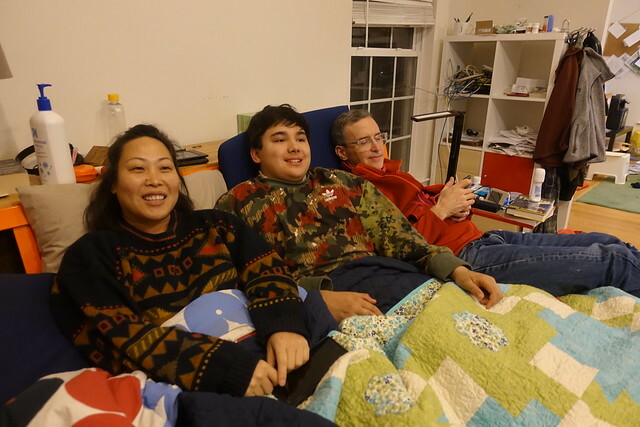 After Edda was put to bed and the boys came home, we introduced Emy to our evening video tradition of us all piling into the king-size bed to watch about 10-15 min of videos. 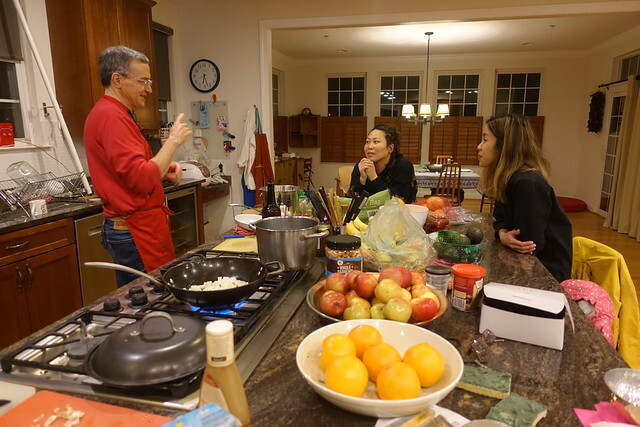 We watched cooking videos - Binging with Babish is one of our favorites. 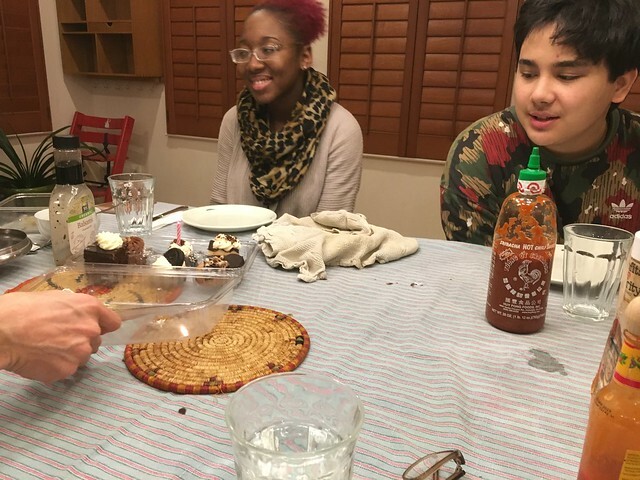 Tonight, we celebrated Arietni's birthday - she wanted chocolate, chocolate, chocolate so I got an assortment of desserts from Whole Foods and we sung after a dinner of Taco Tuesday (but on Wed). We can't decide if our fridge is dying. 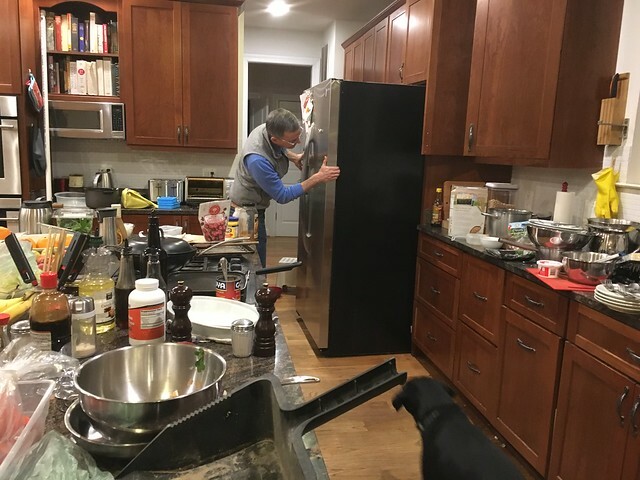 Many moons ago, the water dispenser refused to turn off whenever an innocent person wanted a glass of water, so we had to turn off the water to the fridge to prevent inadvertent flooding in the kitchen. A side effect of turning off the water was the inability to maintain ice production in the freezer. Vince really, really wanted us to replace the fridge because he missed the ice so much, but I refused to replace a perfectly working fridge to have a constant source of ice. We went old school and I bought ice trays and Vince looked at the pair of trays as if they were canisters of photographic film. What are these mom? Then last night, the fridge read 44 degrees even though it was set for 37, so we emptied the fridge into our drink fridge (I know! I know! We have a wine fridge for backup cold cut storage) and emptied the freezer into our chest freezer and pulled it out of its space and waited the night. We started researching consumer reports for replacement fridges. In the morning, the temps were back to almost the right temps. Is it working now? My fridge is playing mind *&^ games with me.